Here in Edinburgh, I am officially done. School is (technically) over and friends are leaving on holiday. But, considering that exams are only a short ways away and following that is the busy packing-crying-leaving debacle, saying I’m “done” might be a bit of an overstatement. I realize that I have a bit of time on my hands, but I can’t seem to get myself outside long enough to do something actually productive. Recently, the past couple of days have looked like this: wake up, make coffee, study for psychology exams, make lunch, LEAVE MY ROOM (this is more of an ambitious goal), go home, go to bed… and then I do it ALL over again. So I guess what I’m trying to say is, well, I haven’t stepped foot in a grocery store for about a week (which means I haven’t taken out any cash for a bit longer than that). In other words, I’m a foodless and broke college student. Not the best combination. To top it all off, I am also a foodie, which means ordinary Cup o’ Noodles and Easy Mac will not cut it for my taste buds. So I finally decided that today would be the day – the day that I rummage through my purse, scrounge up as much change as I can find, and make a run to the supermarket for some nutrition. With my £8 in hand and a mind full of recipes, I left my room. When I got back I no longer had any money, but I did have 5 delectable ingredients and a very empty stomach! Note: If your rice is sticky enough, you can always make rice balls with this recipe – put something in the middle (like a slice of papaya or avocado) and take them with you on a picnic! Bring 1 ½ cups of water per cup of rice to a boil (for this recipe that’s 3 cups of water). Put the rice into the boiling water and cover. 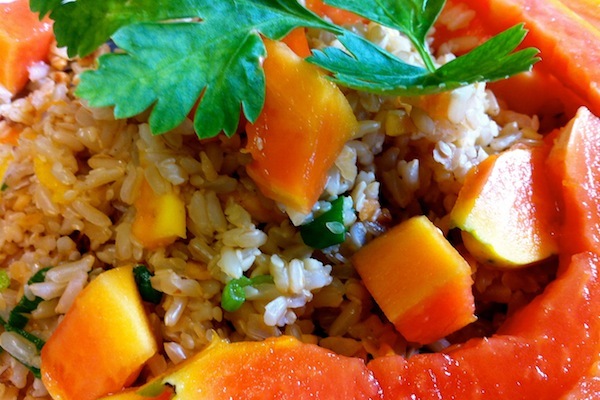 The rice should cook for about 40-60 minutes (brown rice cooks slower than white rice). When all of the water has been absorbed, take the saucepan off the heat and let cool (still covered) for 15 minutes. After the rice has cooled, fluff it. Add salt to your liking. Add the sesame seeds, hazelnuts, and green onions. Add the cubed papaya. Mix together. 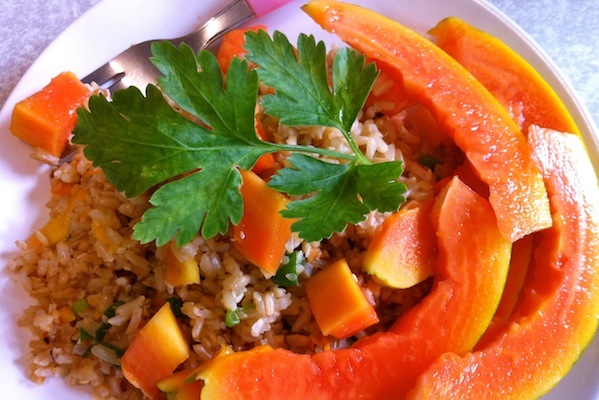 Serve on a plate with sliced papaya on the side. Top with a bit of leftover green onion and enjoy!